If someone said to you ‘go and design your dream kitchen’ I’m sure you’d probably have mixed feelings. Mostly feelings of excitement of course, but undoubtedly some of worry and confusion. How do you even go about starting a kitchen design? What worktop do you choose? What cabinetry style? How can you even ensure everything will stay in budget? But that’s where IKEA can step in. Yes IKEA! 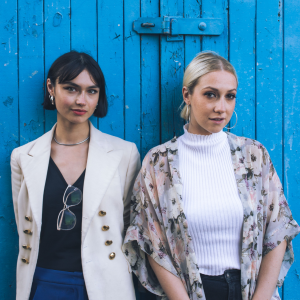 We’ve teamed up with the Scandinavian homeware brand to show you just how easy it is to do, in their new central London Planning Store in Tottenham Court Road. So What Is The Ikea Planning Studio? 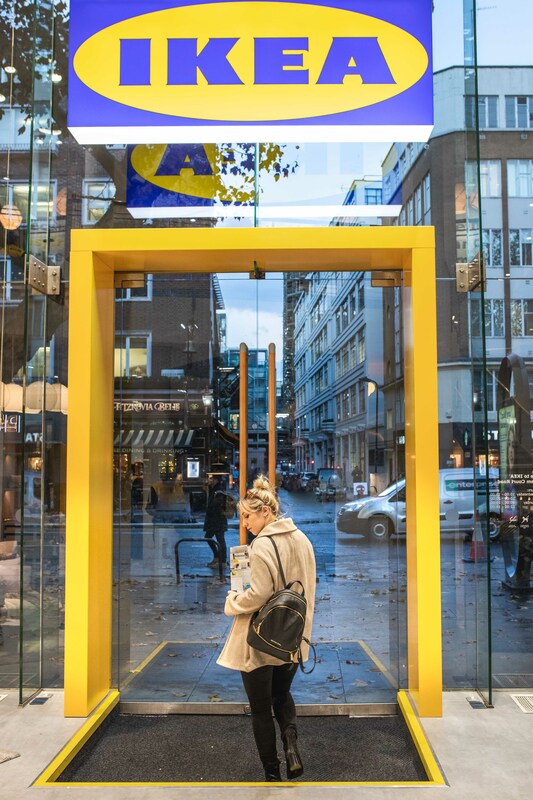 If you’ve not heard about the concept store which opened on 11th October this year, let us tell you that it’s a new way for customers to explore the IKEA brand. No unfortunately there aren’t any meatballs but don’t worry as instead you’ll be experiencing a new personalised service. Think sit down appointments with an IKEA specialist, a cup of coffee and plenty of room sets to get inspiration from (with a focus on kitchens and wardrobes mainly). 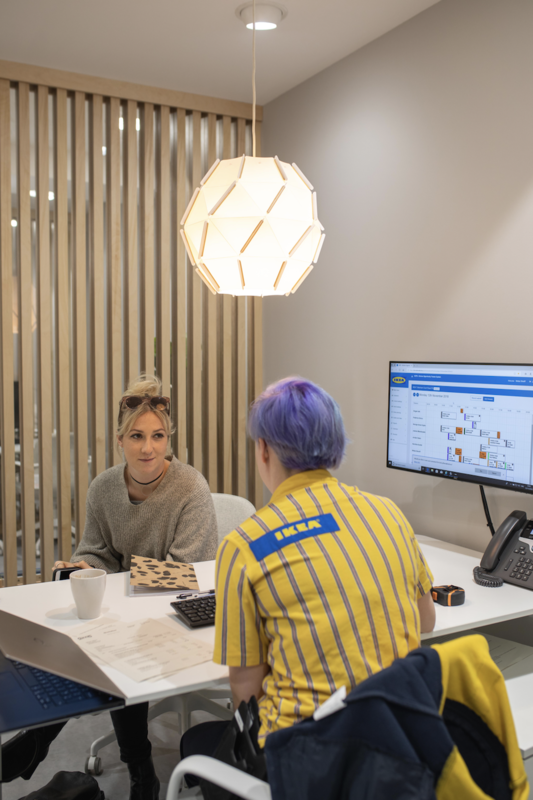 In essence, unlike your traditional IKEA stores, the ’Planning Studio’ as they call it, allows you to accurately plan bespoke kitchens or wardrobes with ease. How? 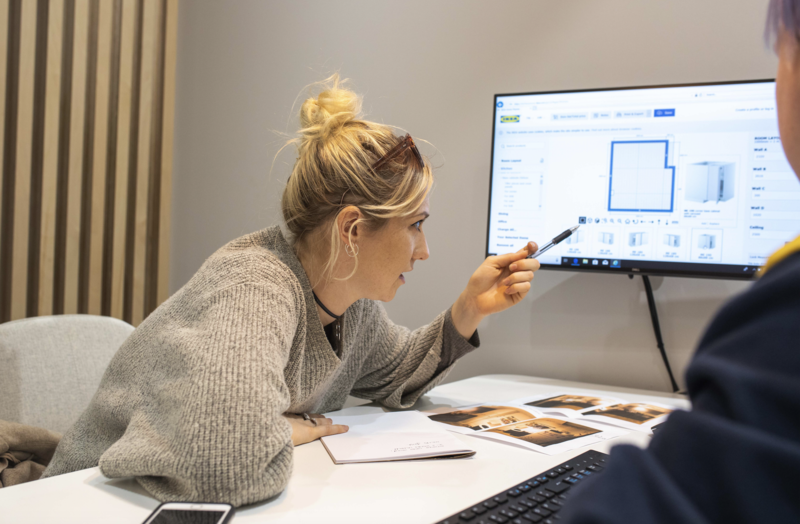 Well everything you’ll want to view like worktops, wardrobe fronts, door handles etc, are all in one place and the addition of having a specialist on hand to help you really takes any stress out of the design process. And let us tell you, being designers, it really does make it stress free! When IKEA contacted me about a potential new kitchen I knew that there had to be a strong emphasis on storage. Living in the inner city (about 10 mins from Waterloo in South London) means that space comes at a premium and the current kitchen set ups drives me insane due to a lack of this. You can barely open a cupboard without something falling on your head! So taking a trip to the IKEA planning studio and having a specialist with me to do this (the lovely George) was a blessing. Even though I’m a designer myself, having someone there who knows things like the dimensions of IKEA cabinets or what products are best for my needs really was crucial in helping me get it just right. I went in to the studio with my measurements, some photos and a rough idea of what I wanted to create in mind. George allowed me to bring this to life and surpassed my expectations of what IKEA could offer. She gave suggestions I would have never have thought of and showed me products I’d not seen before. Needless to say we achieved a lot in our 2 hour session and I left feeling really motivated & inspired. I also left with lots of printables like a render from the IKEA website 3D planner, a quote and an itemised breakdown. If you book an appointment try & go in with detailed measurements and a rough idea of what you’re interested in. Bringing in photos of the space was also useful. The next step is simple – give Stan a call! Stan is one of the many surveyors IKEA use to ensure a design is going to logistically work. For example, we decided with George in store to move the sink into a more central place, but when Stan arrived we realised due to the way our plumbing is, this wasn’t possible. So surveyors like Stan help you to make some tweaks if necessary. The home visit lasted about an hour during which he came up with some fantastic suggestions. Namely a bespoke wine rack idea and slim line cupboards. He also made some revisions and updated the quote. I cannot stress how lovely Stan was, he was genuinely one of the nicest people I’ve ever spoken to and he even bonded really well with my puppy Sasha! Following this home visit, I’ve been booked in with IKEA’s installation team who’ll be visiting me hopefully on December 3rd to start the installation process. Approximately, for me, it’s going to take around 5 days to install, and the team have been really great in helping me get this whole process done swiftly. 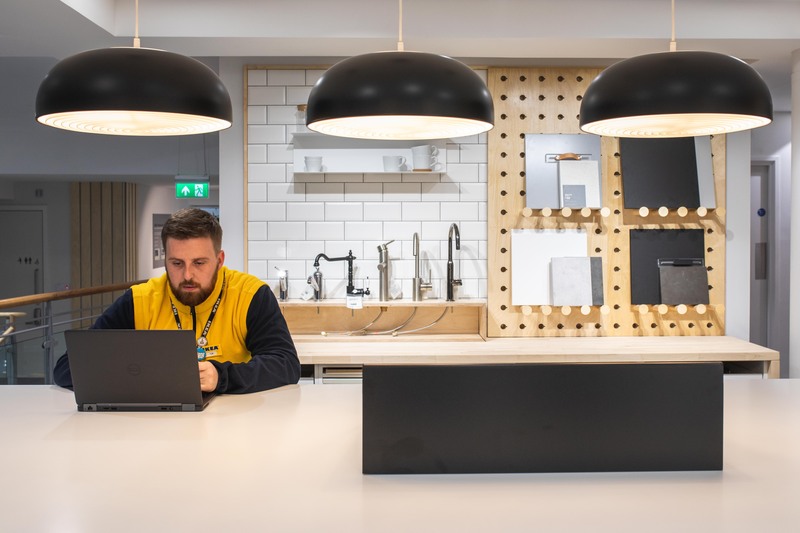 All in all, it’s honestly been a smooth process and I urge anyone who is about to undergo a kitchen or wardrobe design, to take a trip IKEA’s new planning studio”. So we’ll leave on this note, letting you know that soon we’ll have an exciting before & after reveal post. 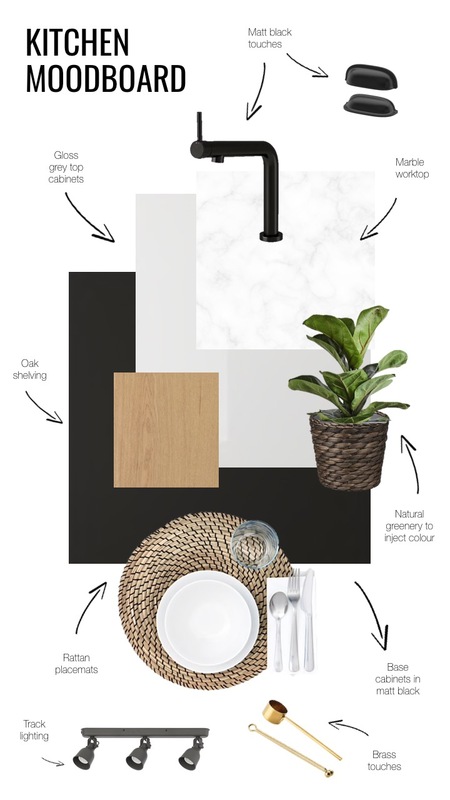 But to leave you hanging on tenterhooks, think matte black finishes, a tile splash- back and a marble worktop. *Disclaimer : Kitchen envy expected. We’ll be showcasing the reveal on instagram first! Follow us here and check out @IKEAUK.